I love duct tape or as I have always called it “Gaffer’s tape”. I grew up in the film industry so we always had silver rolls of duct tape around the house that we used to close, hold or fix just about anything. 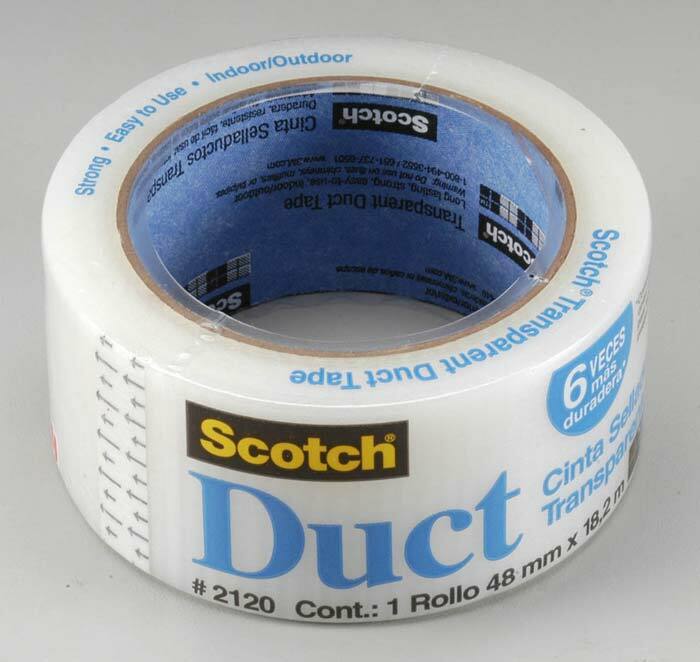 I didn’t even know that it was called ‘duct tape’ until I went to buy some after I moved away from home. I always worked with it in duct tape’s original silver color, I didn’t think it came any other way. Today it has become a unique style item and not just for repairs and accessorizing… there are many high school students that are using it for full-blown fashion statements and other awesome creative pursuits! 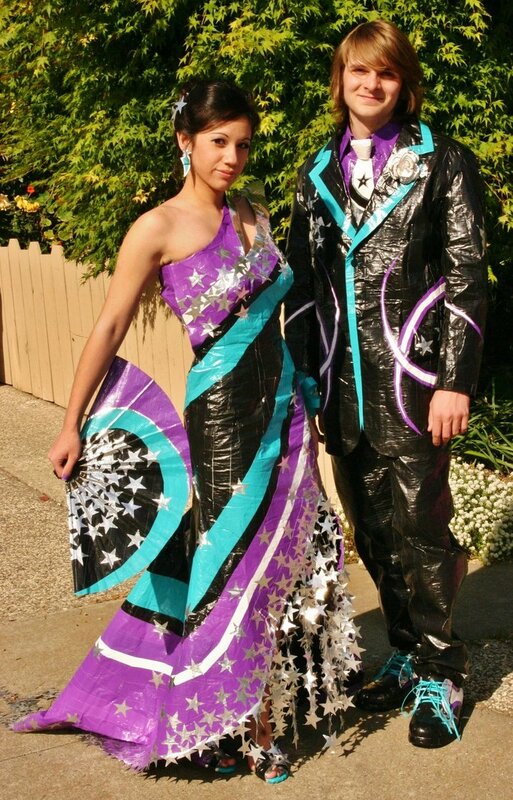 Some fabulous Duct tape Prom outfits by high school students! Amazing! In the film and television industry we use a ton of tape. In the Costume Department we use camera tape (cloth tape), colored paper tape, top stick (skin tape) Scotch (cellophane) tape, packing tape, and my favorite… duct tape! We cover everything with tape, from the shipping boxes we use to move the costumes from city to city… to the repair and maintenance of the actual costumes. Who needs tie downs when you have Duct Tape! Costumers carry their tape in many different ways. A tape roll is a loop of rope that has all the different rolls of tape threaded onto it and can be hooked to a cart or bag… a small length of tape can be wrapped around the end of a pen for quick access. 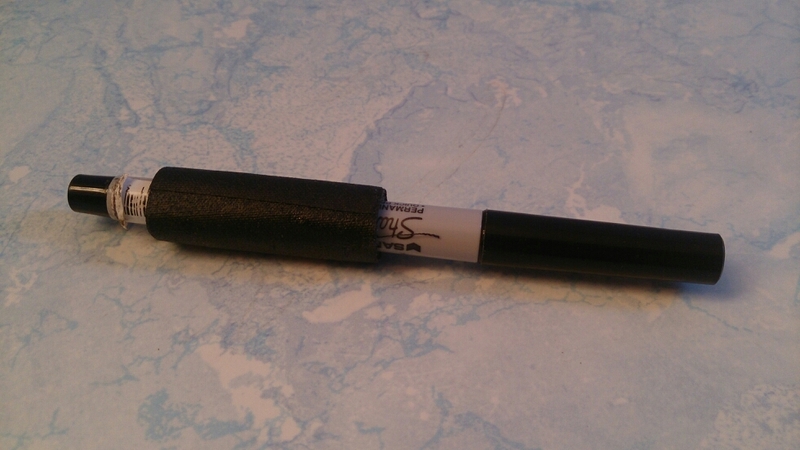 Black cloth tape on a marker… you can still write with this! HAHA… black and white cloth tape, no way you are going to write with this one! I have found that small paint scrapers are an easy way to carry some in your hip bag! You can use a different scraper for each type or color and wind and bit of tape onto it so you don’t have to carry entire rolls on your person. Paint scrapers are easy to clip together and carry along. Plastic paint scrapers are a easy way to store and use small rolls of tape. Depending on the show you may need an entire roll of different types and colors sitting in your bag. 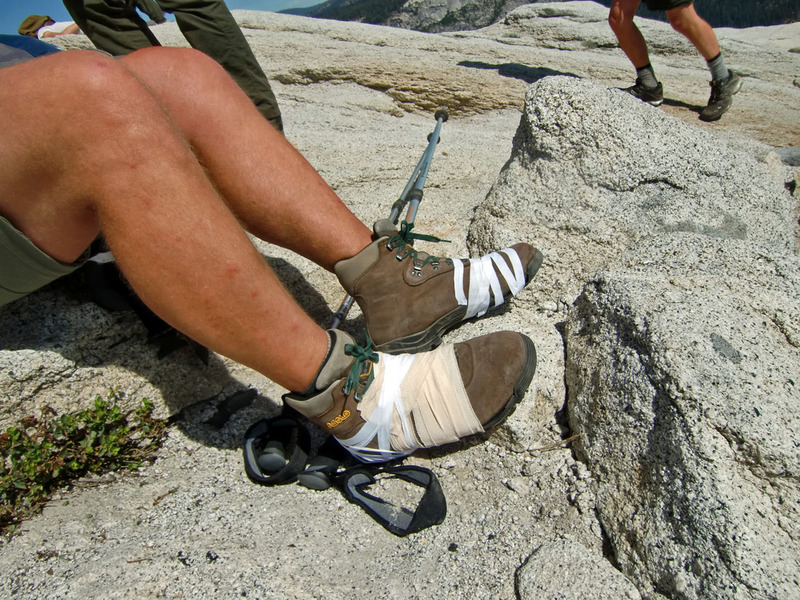 Mostly you will probably carry a roll of black cloth tape and a roll of duct tape. For me I like clear duct tape. You can pick it up in many colors but the clear usually works with most things. I have used clear duct tape to hold harness straps in place, wrap padding for filling out a stunt person, resole boots, fix belts and make hats smaller. I don’t know how we would have keep the costumes together for the harness stunt sequences in “The Chronicles of Riddick” with out yards and yards of tape. Anyone who has worked with foam suits and wire stunts can tell you those two things don’t work well together. It doesn’t matter how much money is spent on a show… 200 dollars or 200 million… it is always the same. Tape and glue! Always have plenty on hand because it comes in handy. When the finished product finally hits the screen and all the costumes look so fabulous and flawless… don’t be fooled!! All those stunning costumes had their day on set when things weren’t working so well. You never know when you will have a costume blow out! Costumes, unlike personal clothing, are often worn day in, day out for 40 – 80 days… for about 12 hours or more each day. The pieces are put through heavy rain, strong sun, sweat, boat rides, shootouts, harnesses, stunts, multiple different bodies and every kind of break down, blood and wear-n-tear we can throw at them. They have a tendency to break apart in the least opportune moments! 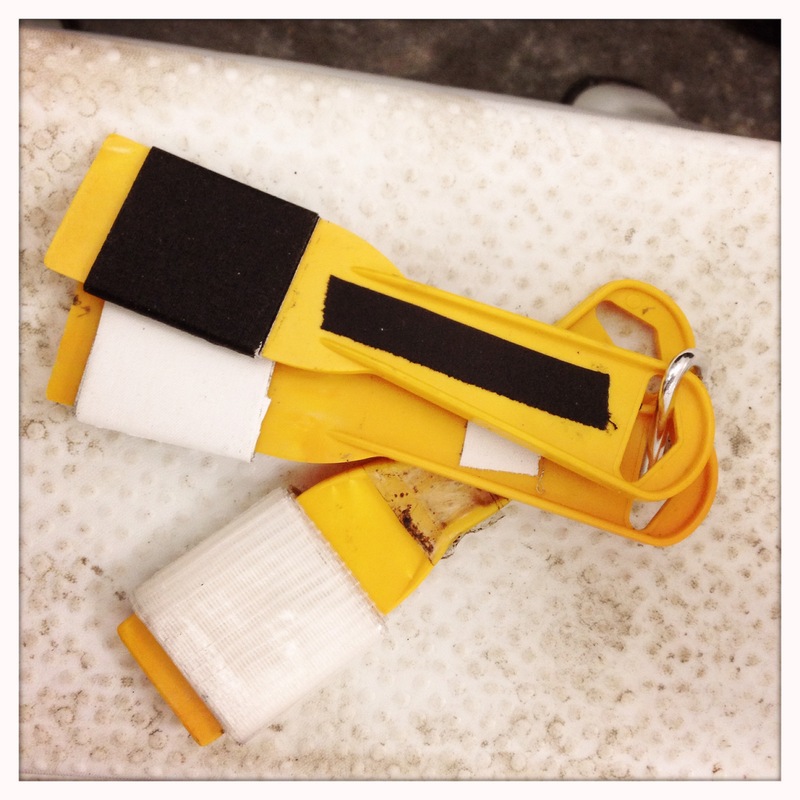 Even on the “simple” shows… it all comes down to tape and glue. “Quick Draw McGraw” tape on your belt! Even amongst the myriad of fine uses for the esteemed duct tape, I learned a while ago that for me one of the most important uses for my duct tape is the removal of makeup on the cast shirt collars. Really! Yep, I learned that this is the easiest way to deal with this never-ending problem (costumer’s bane more like!). This is also why I like the clear duct tape best… it means I can SEE the spot I am working on! Nothing takes off makeup and most smudges better than tape… the stickier the better… this is why duct tape works so well! I know this sounds strange but the powder and oil in the makeup sticks really well to the tape, and when you give the tape a good rub with your finger nail, the makeup sticks to the tape and is able to be pulled away from the fabric with out making a wet spot, like trying to clean with a solution and wipe would. In the past I have used a wet wipes to try to clean makeup off collars during set ups or between shots. Wet wipes can set the makeup into collar and of course leave a wet ring. This means, depending on the shot, changing a shirt for close ups or running for the hair dryer to dry the wet wipe solution off the collar. Next time you have a makeup smudge problem, grab your duct tape and see what can be done to MacGyver the situation. Try to get out that pesky spot with your tape before you pull out the wet wipes. Mythbusters! They can make anything out of Duct tape! PS: I love to watch the Mythbusters! These guys really do appreciate the qualities of duct tape! I thought I would attach a link on the making of shoes. Watching a few of their episodes really shows you what can be done with a simple roll of this amazing stuff! This entry was posted in Technical Awesomness!, The whole Sheblog!, Think and wonder! and tagged actors, Camera, continuity photos, costume, costume department, costumer, Cosutmers, Duct tape, education, film, Film industry, film set, final touches, knowledge, learning, Makeup clean up, set supervisor, skills, Wardrobe, Wardrobe Department, YouTube by dontshootthecostumer. Bookmark the permalink. I love duct tape! And I bet they had a ton of ways to use it. I think it is amazing that the guys from Mythbusters have so many shows on things to do with duct tape!